This diverse collection on the potent plant crackles with stored energy. 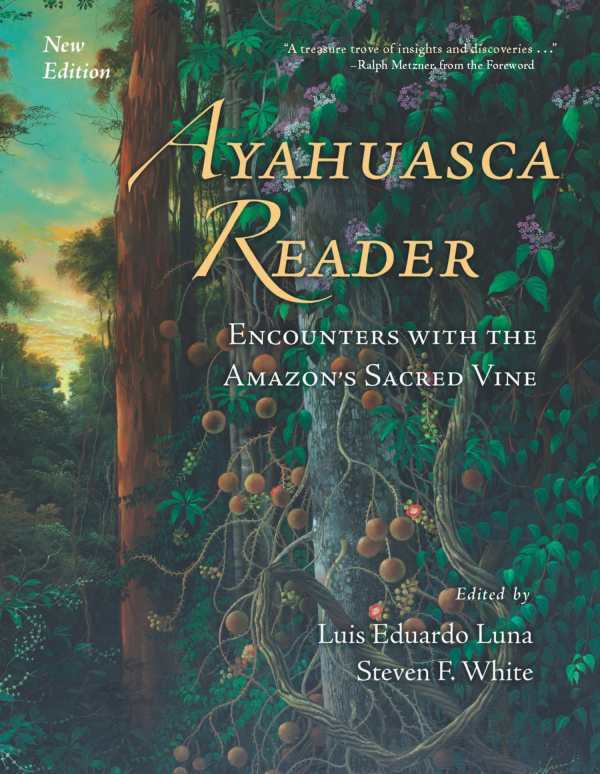 The works assembled in this latest edition of Ayahuasca Reader sing a chorus of testimonies to the mysterious and powerful vine, giving voice to a wide and fascinating spectrum of people who have had occasion to encounter it in its ritual space. Editors Luis Eduardo Luna and Steven F. White “bridge traditional disciplinary gaps” by organizing numerous entry points into the realm of Ayahuasca-influenced consciousness. Pushing back against historic Eurocentric voyeurism within anthropology, Luna and White include a range of reflections from participant-observers, artists, and spiritual devotees. The contrast and commonalities between the psychotropic journeying of Ayahuasca users, compared with plant- and fungi-guided voyages in other global spaces, is made more accessible by way of this collection. Outsider interest in the vine’s potent personal and social healing properties has heightened, especially in an age of psychic expansion, globalism, and renewed Western inquiry into the medical uses of psychedelics. Luna and White have ensured that when possible, translated works are also presented in their languages of origin. The book includes an extensive bibliography, highlighting the challenge of selecting pieces that best provoke deeper understandings of Ayahuasca and its potency. “I have to fit my words inside yours and adapt my thoughts, silencing others that do not fit, that rebel against that confinement you call coherence,” says Ino Moxo, the “Wizard of the Upper Amazon,” in an excerpt from César Calvo. Acknowledging the inadequacy of human language to approximate Ayahuasca-induced messages, even in the lush and visceral poetry inspired by the plant, Luna and White also unleash potent nonlinguistic art upon their audience. A captivating range of visionary and symbolic paintings and textile records, presented as full-color plates, illuminate the vibrant, geometric, and infinite, adding a significant dimension to the reading. The Ayahuasca Reader crackles with stored energy; cultivators of cosmic perspectives, herbal practitioners, students of world spiritualities, and newcomers to the entheogenic experience alike will find themselves immersed in this dense collection.